Yesterday I saw someone at the side of the road with a flat tire. A guy stopped to help him. What was that guy was driving? A Hummer. Not what I expected. The Guardian compares South African cities to American cities. Jo’burg is Los Angeles, Cape Town is San Francisco, etc. The Atlantic has a lengthy but interesting profile of new SA president Jacob Zuma. It raises the question whether he’s the next Mandala or the next Mugabe. Update: Ryan Briggs has a cool maps (and graphs) of Africa representing how many stories the NY Times has done about each since 1981. South Africa leads the pack with 4295 but as a point of comparison there were 10905 about Canada and 10161 about Germany. I got a free sample of Nestea’s new rooibos-based Nestea Red Tea Pomegranate Passion Fruit today while walking around Charlotte. Notice anything wrong with the label? Calories for 8 oz (240mL, which is actually 8.11 fluid ounces): 50. Calories for twice that (16 oz, 473 mL): 110. How’s that work out? Does the bottom half of the bottom have more calories?? It can’t be attributed to rounding. Manufacturers round to the nearest 5 calorie–as demonstrated by various products in the fridge in the kitchen. 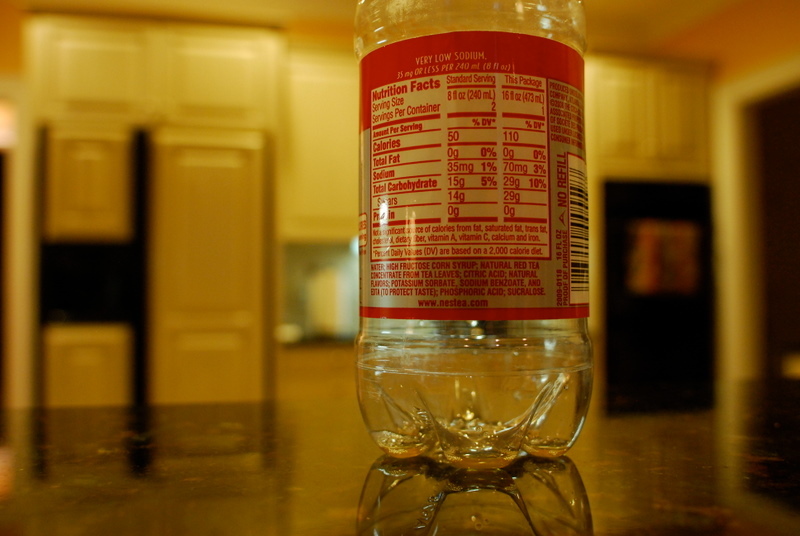 240mL is more than half and even if it was exactly half and the value for the full size was 107.5, then 8 oz would have 53.75 calories, which would round to 55 calories. Can they decide to round to the nearest 10 when other manufacturers round to the nearest 5? *Or, they might just be cheaters. Twelve year old brother of the groom and fellow groomsman at a friend’s wedding: I’m going to steal your hat and go into the [walk in] fridge. Me: You’re going to go into the fridge? 12 y.o. : I already went in there. I farted in it. Best conversation of the weekend so far. 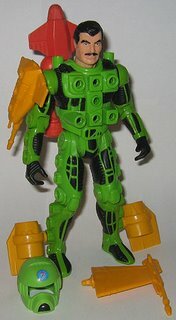 I don’t know why I just remembered this, but one of my favorite toys growing up were the Centurions toys. I don’t really remember watching the show or particularly what it was about, but these bionic guys were great toys to play with. The swimmer guy (Max apparently), was the one I had and I just loved that guy. My brother had the flying guy. I’m not sure quite why he was my favorite. I’m still a swimmer now, though. I think I have a point in here somewhere. Update: My brother just reminded me of M.A.S.K. toys which were pretty incredible, too. I remember having Gator, which was one of my favorites. Wow. Hours, possibly weeks, of my childhood, right there. Is “home” where you have a doctor you like, a car mechanic you swear by and a barber you always go to? I thought I’d give you an update on my SF Muni Project–my project to ride all the bus, light rail, street car and cable car lines in the San Francisco Municipal Railway system. Since the beginning of the project I’ve ridden the 26 Valencia, 67 Bernal Heights, J Church, 21 Hayes, Powell-Mason and California cable cars, 19 Polk, L Taraval and 28 19th Ave. I’ve sort of been setting some rules as I go: I have to ride each line for a certain number of stops, maybe 6. I’m not absolutely sure on that point. Also, I can’t drive to take a bus line. I need to walk or take public transit or something like that. Cable Cars How did it take me this long of living in the area to ride these? They’re awesome. I’m a big fan. I managed to ride when they weren’t that busy with tourists so it was just sort of a pleasant ride on the old, open-aired cars of the system. Fun fact: the California Street line grows out of the one that Leland Stanford started. None of the other lines were quite as exciting. The 67 is fun in that it winds through a hill neighborhood with tiny streets. And on the 26 Valencia, the automated stop announcements say it “Valencha”–like the old-school Missionites, particularly the Italian-American ones apparently say.